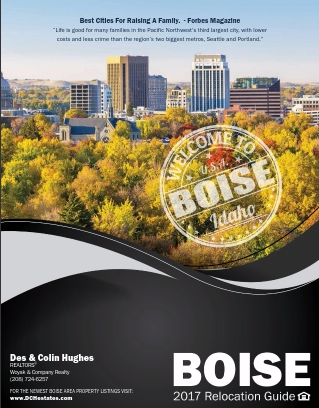 Des & Colin Hughes specialize in buying and selling homes throughout the Treasure Valley! If you're thinking of buying or selling in Boise, Meridian, Eagle, Middleton, Kuna, Star, Emmett, Caldwell and Nampa, including outlining areas on request, we are happy to assist you! Service is everything to us! We believe in always putting our client’s needs first, we strive to provide the service and attention we would want and expect for ourselves if we were buying or selling real estate. We try to always be available as "time is of the essence" in this market. We are both accomplished sales strategists and solution-oriented people, who thrive in challenging, fast-paced environments where our performance directly impacts the bottom line. In addition, we have solid organizational and negotiation skills that make a strong contribution to our clients real estate transaction needs. Real estate is one of the largest and most exciting investments one can make. We're here to ensure your process is a fun and rewarding one! This can help you find homes, answer questions, browse neighborhoods, keep you up to date with news in your market, and even help you find out what your home is worth!